When the respondents to the 2007 Strategy Execution Benchmark survey were asked to select the most important business issue currently facing their organizations, an outstanding sixty-one (61) percent of respondents felt that “executing strategy” was at the top of the list. The majority of respondents (84%) reported that their organization had a strategic plan, but plan execution was foremost on their minds. This survey is built on the foundation of The Strategy Focused Organization, the groundbreaking book by Drs. Kaplan and Norton, and was first conceived in 2003 as a way to assess usage of the strategy execution (or strategy management) principles and to ascertain what types of benefits were received through use of these principles. These same esteemed authors invented the Balanced Scorecard as a new way to work with business strategy, and it has become the hallmark of a well-run organization. We believe the Balanced Scorecard is an excellent management tool and created our online strategic planning system based on the same framework. In addition to helping develop a strategic plan, the Balanced Scorecard is also one of the best tools around to help monitor your plan progress and execution. It is to be used as both a measurement and management tool to assist in fulfilling your company’s vision. You can use it to make your company more strategy-focused and deliver demonstrable performance that is aligned with your vision and mission. Identify the right measures. Build your scorecard from the measures (key performance indicators, metrics) associated with your short-term goals, but keep in mind that just because you picked a measure to track a goal doesn’t mean it’s a good measure. If you determine that some are meaningless or hard to track, find new ones. Establish increments that mesh with the targets. Make sure to get the right time frame and size of measures. For ease of tracking, try to use the same increments for all your measures. For example, if you are reporting monthly, use monthly measures. Identify the data source. Clearly identify where the numbers are coming from and who is responsible for reporting on it. Input numbers monthly. Enter numbers every month for each measure. Use a “Year to Date” column to track running progress. This column should add up or average all the months entered to date. See the big picture. Remember, the primary purpose of key indicators is to give you the big picture with a relatively small amount of information. If you aren’t seeing the big picture, change the measures. Take action. The whole point of using a scorecard is to make adjustments to the business now and on time before it is too late. Regular strategy meetings will easily facilitation this. Make it part of the strategic plan manager’s job to provide a monthly scorecard report. Both Scorecards and dashboards are suspepod to give you an idea about the present situation and how does that situation match compared to the general objectives of the company/hospital. Thus it’s aimed to top-management people (even if we can imagine a detailed dashboard view by department or medical unit). In that context a dashboard is more a methodology that gives you advices, best practices on how to present the information (gauge, chart, pivot table, scorecards, KPI, where?, how much items?, ) etc. Scorecards is a tool in itself (that might be included into a dashboard) that summarize KPI (Key Performance Indicators) into a simple, readable and meaningful view with indicators (commonly traffic lights) that allows decision takers to have a global insight on how the company/hospital is performing now compared with the goal we set out Scorecard also gives the trend by KPI. It’s commonly divided into three perspectives that are in close relation thanks to a strategic map : learning and growth, operational performance, customer/patients and financial Performance. 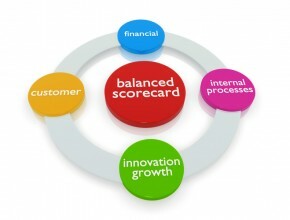 An important remark is that scorecard commonly put Finance on top I mean as the main objective. Hospital on the contrary should put patient (customer) satisfaction on top.